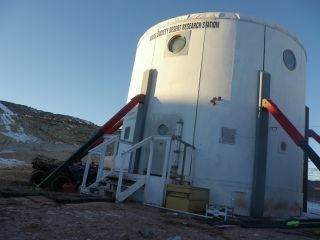 The Mars Society's Mars Desert Research Station near Hanksville, Utah, photographed in January 2014. A simulated Mars mission kicks off Saturday (Feb. 7) in Utah, and its seven crewmembers hope the experience helps them prepare for a real Red Planet expedition a decade from now. All seven explorers — who will spend two weeks at the Mars Desert Research Station (MDRS), near the Utah town of Hanksville — are astronaut candidates for the Mars One project, which aims to launch four pioneers to the Red Planet in 2024 as the vanguard of a permanent colony. "I can only speak for myself, but my participation on a Mars One crew was an effort to show that there is so much more behind the candidates," Gerardi told Space.com via email. "We’re not a group of planetary malcontents who are ready to flip the bird at Earth and hop on a rocket. My crew is a group of industry professionals, including MEDVAC pilots, engineers, doctors and NASA researchers who recognize that space settlement is feasible in our lifetimes." MDRS is run by the Mars Society, a nonprofit organization dedicated to the human exploration and settlement of the Red Planet. MDRS missions aim to bring that ambitious goal closer to reality, by helping our species prepare for the rigors of living beyond Earth. Toward this end, Gerardi and her colleagues — the 149th crew to use the facility — will perform a number of different research projects. The focus will be on in-situ resource utilization (ISRU) techniques, which could help an off-Earth settlement become more self-sufficient. One study will investigate the use of 3D printing, while an "insect palatability experiment" will look at taking advantage of a plentiful but underutilized source of protein. And then there's the "proof of beer" study, which will test the viability of sorghum seeds and hops rhizomes in simulated Mars soil. "The academic reasoning is that sorghum is a grain of high nutritional value with relatively low water needs, and hops are used as a medicinal herb," Gerardi said. "The fun reasoning is that yeast has already been sent to space, so if we prove germination and root establishment of two other constituent ingredients of beer, we have essentially proved that one can produce beer on Mars." "Of course, it would probably be in our best interest to taste the closest terrestrial analog to this beer while we’re there," she added. "I'm pushing for that part of the 'research' to take place on my birthday, which falls right in the middle of our Crew rotation." MDRS Crew 149 is led by commander Paul Bakken. The other crewmembers, in addition to Gerardi, are Ken Sullivan, Pamela Nicoletatos, Elena Miscodan, Takeshi Naganuma and Ann-Sofie Schreurs. Bakken, Gerardi and Sullivan are American, Nicoletatos is Canadian, Miscodan is from Romania, Naganuma is Japanese and Schreurs is German. Mars One, a Netherlands-based nonprofit, plans to launch a series of robotic missions to Mars beginning in 2018, to prove out technologies and pave the way for the first crew's arrival in 2025. The organization intends to pay for its activities primarily by staging a global media event around the colonization process, beginning with astronaut selection.